Rihanna graces the cover of US Vogue for the second. For the cover and editorial of the November 2012 issue she was photographed by Annie Leibovitz and styled by Camilla Nickerson. Her hair was done by Rihanna’s trusted stylist Ursula Stephen and makeup by Aaron De Mey. Against a dusty desert background Rihanna wore a lace and leather dress from Valentino Resort 2013 with fingerless gloves from Gaspar. She wore black mules from Céline Resort 2013 that were used throughout the photoshoot. 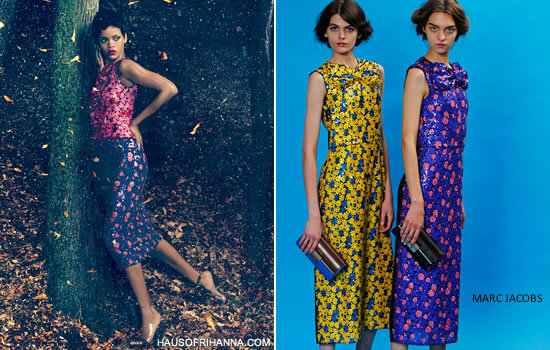 Here Rihanna posed amongst verdant trees and shows some vulnerability in a silk dress from Christian Dior Haute Couture Fall 2012. 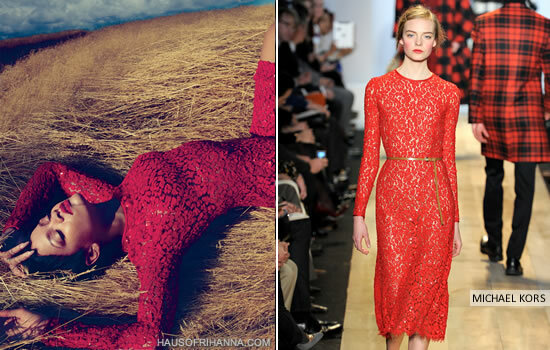 Rihanna is relaxed and red hot in this embroidered lace floral dress from Michael Kors Fall/Winter 2012. Like a cat stalking her prey Rihanna looks confident in a black bustier bodysuit from lingerie brand Rosamosario and a lace pencil shirt with fur trim from Revillon Resort 2013. 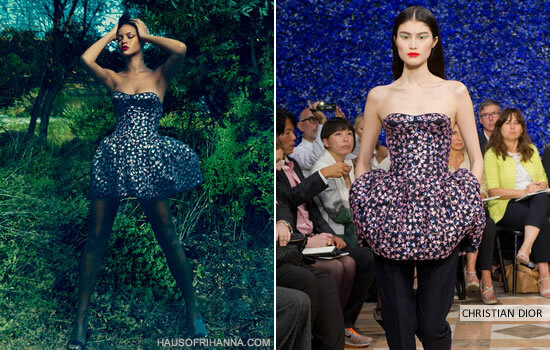 Rihanna already wore a dress from Marc Jacobs Resort 2013 for her Oprah’s Next Chapter interview but this time she donned a sequined top and skirt from the collection.